West Gunners are seeking to become the first repeat champion in the history of the Hon. Julian Fraser Save The Seed Basketball League. 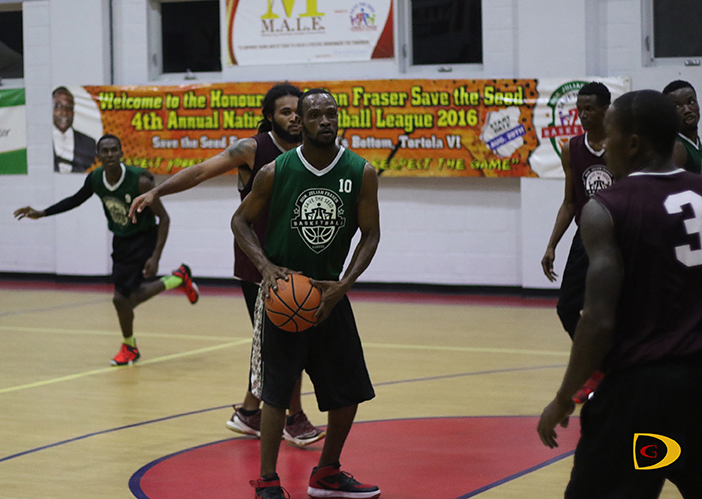 Led by brothers Ray and Rowan Victor who had 17 points each, West Gunners whipped the Warrias 100-72, for a 1-0 lead in their best of three semifinal series on Sunday night—after ending 2014 champions Bayside Blazers three games winning streak on Saturday. Ray had seven rebounds and six assists while Rowan grabbed eight rebounds to go with seven steals and dished out four assists. Romain Minott and Douron Phillips added 16 and 15 points respectively—with Minott notching seven rebounds, six steals and six assists. Juan Hatchett had a game high 29 points and nine rebounds for the fourth seeded Warrias, who upset Momentum in their series. Jaimez Stout added another 12 points to the tally. In the Eastern Division, Aubrey Daniel recorded a triple double in leading the Splash Brothers to a series evening 92-86 victory over Next. Daniel had game highs of 28 points, 14 rebounds and 11 assists. Steve Parillon followed up with 22 points including six treys. Shamoi Dagou and Ashield Frett added 14 and 13 points respectively. Killven Solomon was Next’s top scorer with 23 points. He also had 10 rebounds and dished out eight assists. Enrico Harrigan, Eustace Freeman and Clint Weston dropped in 12 points a piece. Freeman and Weston each also pulled 10 rebounds.